Currently teacher of printmaking at Manhattan Graphics Center in NYC, the Center for Contemporary Printmaking in Norwalk (CT), and the Visual Arts Center of New Jersey in Summit. Book illustration for What to Listen for in the World, by Bruce Adolphe, 1996. New York: 1st Limelight ed., Proscenium Publishers, Inc.
Work in permanent collections including: The New York Public Library, The Museum of Modern Art, the New-York Historical Society, and the Brooklyn Museum of Art in New York City; the U.S. Library of Congress in Washington, DC; the William Benton Museum of Art in Storrs, Connecticut; the Ashmolean Museum in Oxford, England; and the National Gallery of Modern Art in New Delhi. 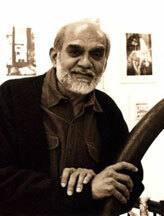 2004-6 "Multiple Encounters: Indo - US Print Exhibition in India" (co-curator), at: the Indira Gandhi National Centre for the Arts in New Delhi (2004); the American Center in New Delhi (2004); the Government College of Art in Chandigarh (2005); and the Rajasthan Lalit Kala Akademy in Jaipur (2006).